Currently, Amalie works at the Mediamax media company. Amalie is a journalist and columnist with over 3 years of professional experience. She covers local and international affairs relating to culture, education, tourism and social matters for Mediamax.am and Banks.am. With a Bachelor’s degree in Linguistics, Intercultural Communication and International Journalism, she has worked in different areas of journalism. During her studies, Amalie wrote articles for 168 Hours newspaper and later worked as a TV reporter at the Yerkir Media TV company. 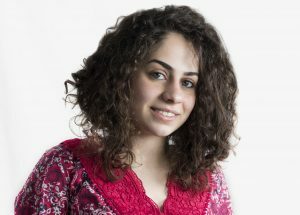 Amalie’s work experience also includes several internships at different Armenian media companies. Amalie is interested in making social impact as well. In 2017, she participated in Erasmus+ project, the European Volunteer Service (EVS), and volunteered at the A.C. Patria NGO in Lithuania for over a year.